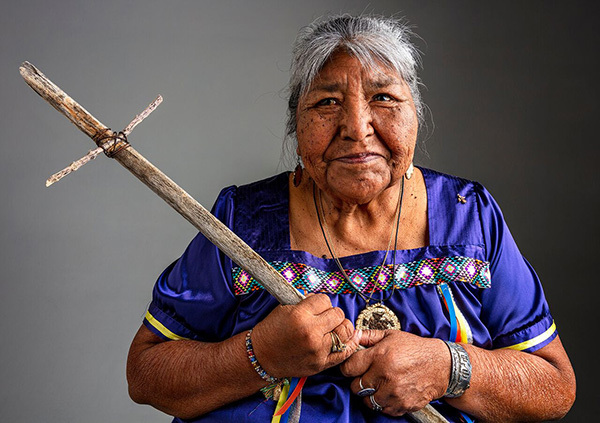 AUTHOR’S NOTE: In 2018, SFA awarded a Master-Apprentice Artist Award to Stella Tucker, a Tohono O’odham elder and teacher, in honor of her work upholding the tradition of the baidaj, or annual saguaro fruit harvest. The award provided support for Stella’s work passing along the tradition to her daughter, Tanisha Tucker. Stella’s recognition was meaningful for me, as it connected several threads of my life and work—as a performer, writer, and folklorist. I first met Stella eight years ago when my friend Brad Lancaster invited me to “go help Stella pick fruit.” I wasn’t exactly sure what he meant. We woke at dawn and drove to Saguaro National Park, turning down a dirt driveway marked with an orange cone. “Glad you brought buckets!” Stella said, greeting us with open enthusiasm. It was late in the season and we spent the morning searching the ground for jun, dried saguaro fruit, which remains after the ripe fruits have been gathered from the crowns by animals or people. We thanked the saguaros for their gifts, ate the sweet fruit along the way, and presented Stella with the contents of our buckets. I returned to Stella’s camp in 2016, while directing Standing with Saguaros, a year-long dance-theater project I created in collaboration with Borderlands Theater to celebrate the cactus and its role as a keystone species in the Sonoran Desert. I organized several visits for community members to help Stella harvest, and with her permission, incorporated her story into our final public performance in Saguaro National Park. 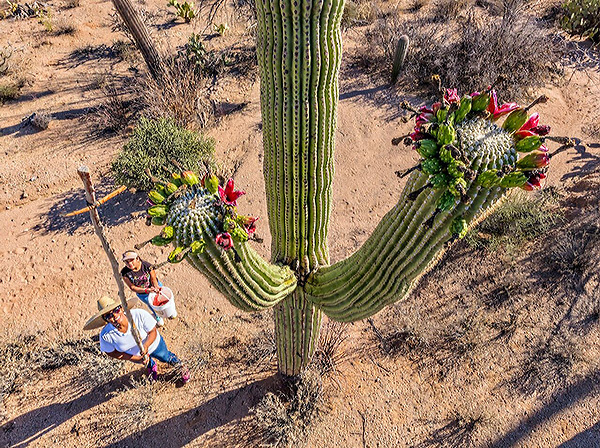 I wanted everyone I knew to see how dedicated Stella was to the saguaros, how her respect for them was transmitted by her commitment to upholding a cultural tradition that not many were continuing. I felt a kinship with her—and I knew others would too. Indeed, I saw it was possible to befriend and love a species as part of one’s own community, that another species could itself be kin. When I first saw the portrait Steven Meckler took of Stella, part of our publicity for all Master-Apprentice awardees, I gasped at how he’d captured her. I was awed by the joy in her eyes, the knowledge in her hands, the secret delight of her smile. I don’t know what she was thinking about the moment the shutter release clicked, but I like to imagine she was recalling the miles and miles of desert she’d walked across over the decades, moving from saguaro to saguaro, tending and befriending each one. The last time I saw Stella was on the Day of the Dead, last November. She was sitting among the saguaros in the Sus Picnic Area of Saguaro National Park. She and her daughter Tanisha had just shared the magnificence of the cactus and a taste of its sweet syrup with some 40 theatre-makers visiting Tucson for an annual gathering of Network of Ensemble Theaters. As the group interacted with Stella, I thought about how her effusive love for place and tradition would now be carried across the country, in the hearts and minds of all those artists, their reverence for her already as big as the sky. Stella died on January 9 at age 71, surrounded by her family. Desert dwellers know that the first sight of saguaro blooms means a shift is coming. Several, actually. In short order, white floral crowns give way to blood-red fruits. Bees and bats give way to doves and woodpeckers that come to feast. And then, with any luck, the skies release the monsoon rains. All the while, we humans stand below, wide-eyed with craned necks, hoping for either a taste of fruit or that first drop of rain. Everyone but Stella Tucker, that is. For Stella, a 70-year-old Tohono O’odham grandmother, this annual ecological unfolding means it’s time to get to work. 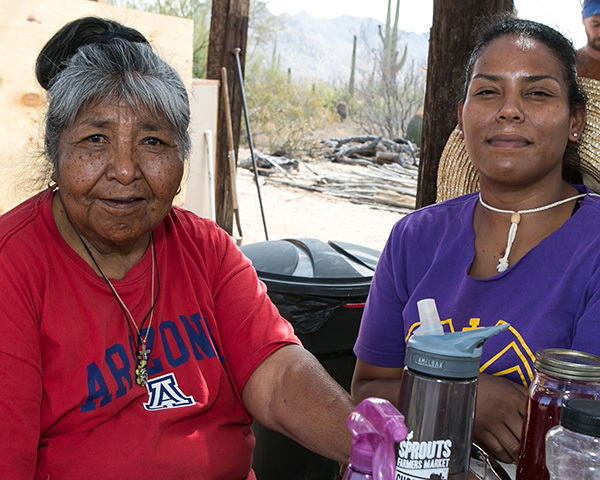 Every year, in late May or early June, Stella and her daughter, Tanisha Tucker, 35, pack up the essentials and move their household to a two-acre patch of desert within Saguaro National Park’s Tucson Mountain District, where generations have continued a cultural tradition called baidaj, or saguaro fruit harvest. 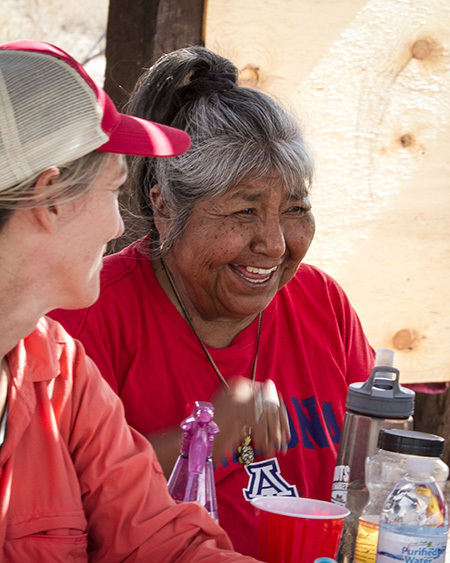 While Stella harvested saguaro fruit as a young girl with her grandfather near Sells, it wasn’t until she visited the camp of her grandmother, Juanita Ahil, in the park, that her devotion began. “I just fell in love out there,” she says. Located a mile from the park’s visitor center, the camp has a field kitchen complete with pots, ladles, and screens from Stella’s grandmother’s day. Ramadas made with mesquite posts and saguaro ribs shade picnic tables and sleeping cots. The camp is unusual because of its location on public lands, where harvesting is otherwise prohibited. When the 25 square miles of desert on the west side of Tucson, which included Stella’s family camp, was added to Saguaro National Monument in 1961 (it was elevated to national park status in 1994), monument officials were concerned about the harvest and initially prohibited it. But, as Stella recounts, friends from the Arizona-Sonora Desert Museum wrote a letter to the U.S. Department of the Interior on behalf of her grandmother, and then-Secretary of the Interior Stewart Udall granted permission for the harvest to continue. Today, a special permitting process between the Tohono O’odham Nation and Saguaro National Park allows Stella to uphold the tradition. Stella took over the camp after her grandmother died in 1994. A temporary home during the harvest season, the camp has become something of a mecca for those wanting to understand how ecology, food, culture, ceremony, and stewardship come together. Stella is its benevolent matriarch. Of Stella’s two remaining children—one of her daughters died three years ago—Tanisha is the most committed to continuing the harvest. She has helped her mother consistently with the harvest for the past five years and now takes on the lion’s share of teaching, with her cousin, Maria Francisco. Stella is grateful that her daughter has stepped up to help her. “It’s a dying culture. One day nobody will know how to do it. I want them to learn. It’s really important to me that they learn and keep this culture going,” she says. The harvest begins in late May or early June, depending on when the saguaros flower. Red, ripe fruits used for syrup and jam are picked from the cactus using a kuipad, or harvesting pole, made from saguaro ribs. A short creosote branch is fixed to the top and used as a cross bar for leverage when gently knocking the fruit off the saguaro. This show of respect is essential, Tanisha says, along with ensuring that enough fruit is left for animals and for beauty. “We’d never want to see the day that the syrup is on a Walmart shelf. That would lead to overharvesting and a corporate takeover,” she says. Later in June, any remaining fruit on the saguaros dries and falls to the ground. “Those are the best ones to pick, ‘cause they’re clean and you can take them home with you and have fruit anytime you want during the year,” Stella says. In recent years, bad knees have prevented Stella from harvesting, so she presides over the processing and cooking stage from one of the camp picnic tables. Those who help with the harvest contribute fruit to the processing and cooking, but also get to take some of their harvest home. 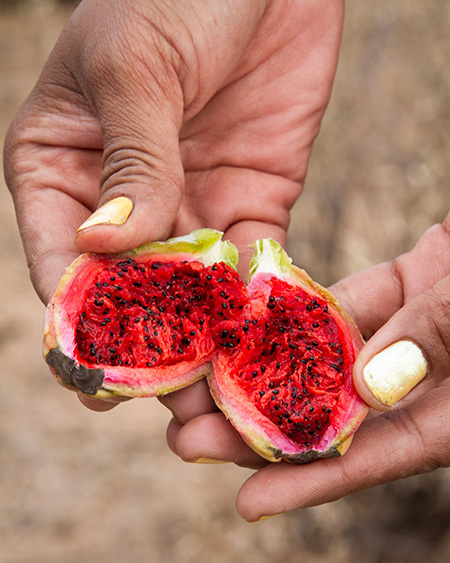 Once picked, the fruit is soaked in water then transferred to a pot and cooked over a mesquite-wood fire. Debris from the harvest is skimmed off the top, and the fruit is strained through a wire screen to separate the fiber and seed from the juice. The liquid goes through another strainer or cheesecloth and is then cooked for several hours to become syrup or jam. For Tanisha, the smell of saguaro fruit cooking roots her firmly in the tradition. “It makes you feel like, ‘Yes, this is my accomplishment and I worked hard today and this is my prize.’ It’s beautiful, a liquid gold,” she says. Stella sells some of the syrup she makes and also donates it to the annual Tohono O’odham Nation wine ceremony, or jujkida, which is said to “sing down the rain” for summer planting. “You go from house to house, people inviting you over. It lasts the whole weekend and there’s a lot of singing,” she says. Both Stella and Tanisha understand their role as stewards of a cultural tradition, one grounded in a spirit of reciprocity. 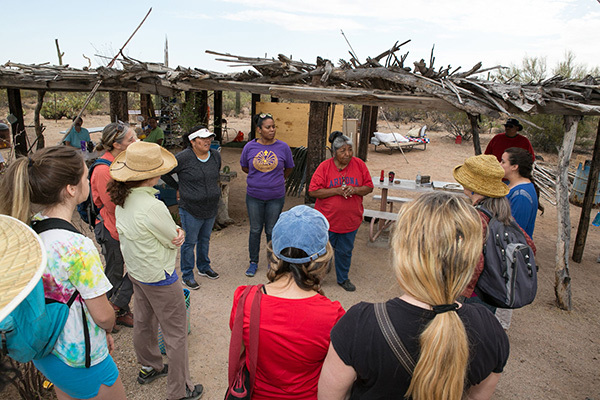 Every year dozens of groups visit the camp, many of them O’odham, including groups hosted by the poet Ofelia Zepeda and by the San Xavier Co-op Farm. “A lot of them don’t know anything about saguaros,” Stella says. 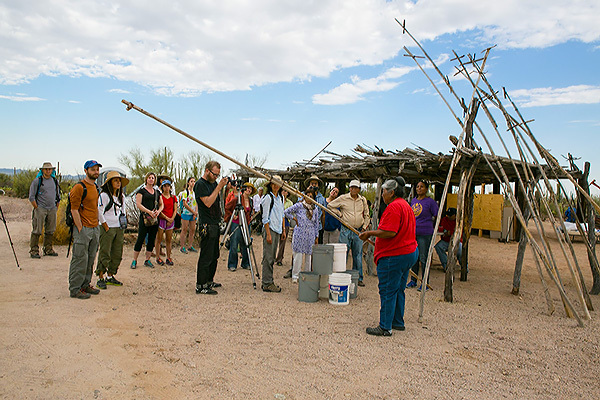 Valentina Vavages-Andrew, an ancestral ranger with Saguaro National Park and also a member of the Tohono O’odham Nation, coordinates trips for native youth to participate in the harvest. “It’s important for the youth to get their hands dirty and take part in the processing,” she says. Vavages-Andrew says the trips also reveal the deeper meaning of the harvest, which signals the O’odham New Year. The actual date of the New Year comes in the first half of July, depending on the end of the harvest and the coming of the rains. For many years the Arizona-Sonora Desert Museum brought classes and workshops to Stella’s camp. One year Gary Owens signed up for one. An Akimel O’odham from Salt River Pima-Maricopa Indian Community, Owens had wanted to learn how to harvest for years, but couldn’t find elders in his district to teach him. Barbara Rose who runs Bean Tree Farm—a desert farm offering hands-on workshops about desert foods, herbs, and earth-building—started helping Stella harvest in the mid-1990s. “There was always just a real love and attention and welcome and graciousness,” Rose said of the camp. From Stella, Rose learned a stalwart dedication to water conservation. “Stella doesn’t waste a drop of water. Never is anything rinsed and thrown on the ground. 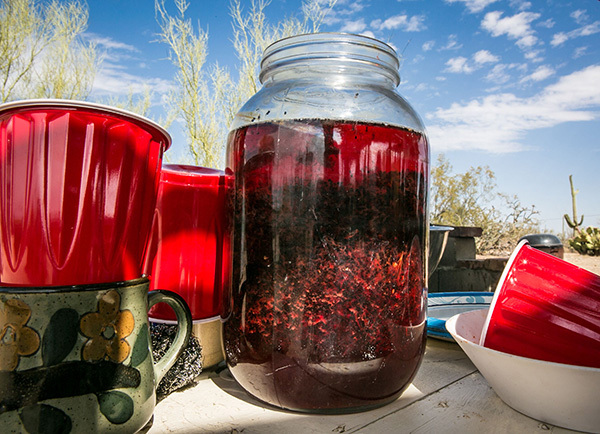 You rinse your hands into the water cooking the saguaro syrup,” Rose said. Support Stella’s camp and continuing efforts to educate young O’odham about the tradition here. Arizona Illustrated featured a special segment about Stella produced 25 years ago for “The Desert Speaks” (starts at 17:15). Listen to an interview with Stella Tucker hosted by Kimi Eisele on The Saguaro Minute, KXCI, 91.3 Community Radio. I remember Saguaro National Park back in 1956-57. So happy to read this. Many thanks!